Foundation work for a new firehouse for the Rockaway Beach Volunteer Fire Department has been started, and members hope to have the station in service by the time cold weather arrives. They will do all the work on the one-story concrete block structure, which will have a tower for drying hose. Organized three years ago, the company has about 100 active members. Pending construction of a permanent station, their fire engine is housed in a converted double garage. Charts H. Doing, county zoning commissioner, yesterday approved a commercial rating for the site of he new station, on the east side of Greyhound road at Turkey Point road. He stipulated that two-and-a-half times the area of the building shall be reserved for off-street sored by the firemen. The Rockaway company protects the Back River Neck area south of Cape May road. A. 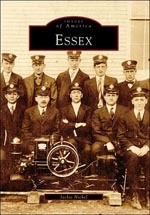 B. Fitzwater is fire chief, and other officers include John Neis, president; William Motschleidler, vice president; Fred Siegman, secretary: L. A. Sinclair, treasurer; William Flees, Charles Ziegler and F. L. Decker, trustees. The new station will be financed from the proceeds of a series of crab feasts and bull roasts sponsored by the firemen.